The Artists Cooperative Gallery in the Old Market will feature member artist Judith Anthony Johnston in February in her first solo exhibit at this venue. Self-titled Walk with Me: a journey in silence, the exhibit includes an opening artist reception Friday Feb. 2, from 6:30 to 9 p.m. at the Co-op, 405 S.11th St. Though Johnston has a portrait studio and gallery in West Omaha, the well- travelled artist says this exhibit reflects work that is more personal in nature on several levels. 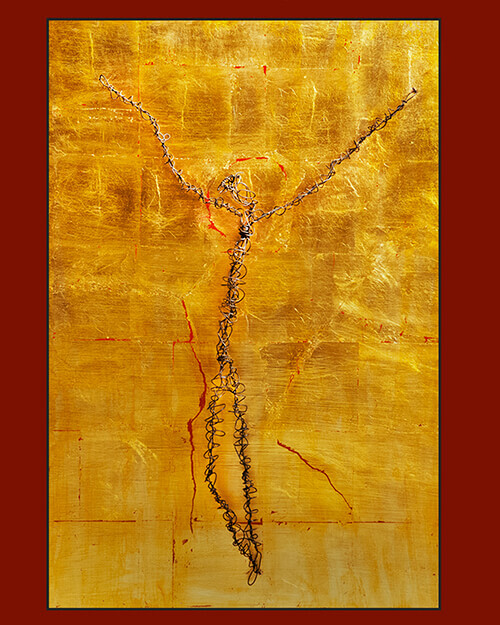 Working in gold and metal leaf, oils, charcoals, wax and wire sculpture, her art is only subtly representational as she has described her journey as a quest, “searching for the abstract soul,” the title of a 2015 mixed media exhibit at the Burkholder project in Lincoln. As a member of the Artists Cooperative Gallery, Johnston participated in a cultural exchange in 2016 organized by the Sophia Wanamaker Gallery in San Jose, Costa Rica with four other artists who share her wanderlust: Lori Elliott-Bartle, Cheri Ginsburg, Katrina Methot-Swanson and Linda Hatfield. The fellow travellers then collaborated in a popular group show at the Hot Shops Center motivated by their Costa Rican tour. Johnston’s contribution continued to reflect her themes of spirituality, non-conformity and morality, which also unify her work seen in Walk with Me. Not only can Johnston’s art be seen at the Co-op, she has shown with Connect Gallery at 3901 Leavenworth Omaha, the Burkholder Gallery Lincoln, NE and with Revolve Omaha. 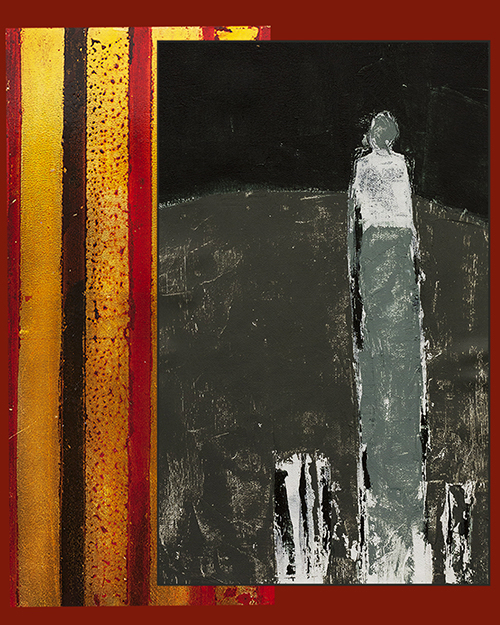 Walk with Me: a journey in silence runs from Jan. 29 to Feb. 24 at the Artist Cooperative Gallery, 405 S. 11th St. with an artist reception, Friday, Feb. 2 from 6:30-9 p.m. For details and gallery hours go to artistscoopomaha.com.